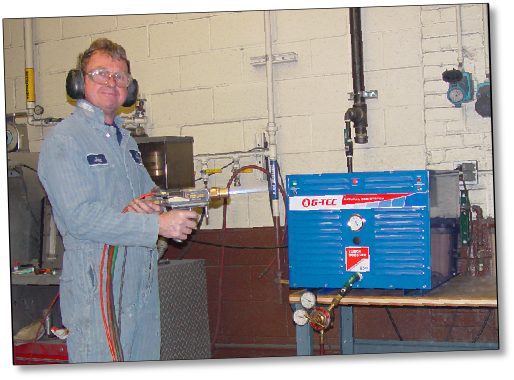 ASB Industries in Barberton, Ohio replaced propylene with high pressure natural gas and cut fuel gas costs by $10 per operating hour, eliminated downtime from gas reliquification in the spray gun and stopped refilling dozens of empty gas cylinders. A G-TEC Torch Booster can be installed right next to your metal spraying equipment - no need for an expensive compressor that requires an outdoor concrete pad ! High pressure natural gas is an excellent fuel for High Velocity Oxy-Fuel (HVOF) thermal spray, flame spray, combustion guns and similar metallizing applications. Natural gas costs up to 75% less than propane or propylene for equal heat performance and it is much cleaner than liquid fuel gases. And because natural gas is always a gas it will not re-liquify in your spray gun and force expensive downtime while the gun is cleaned. Natural gas performs well with coating quality equal to slightly better than propane or propylene. 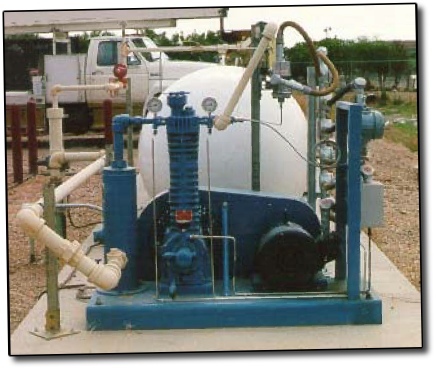 Until now using natural gas required a large, expensive compressor installed outdoors on a concrete pad with expensive welded high pressure piping running through the building to the HVOF booth. Frequently a building permit is required to install this type of compressor. 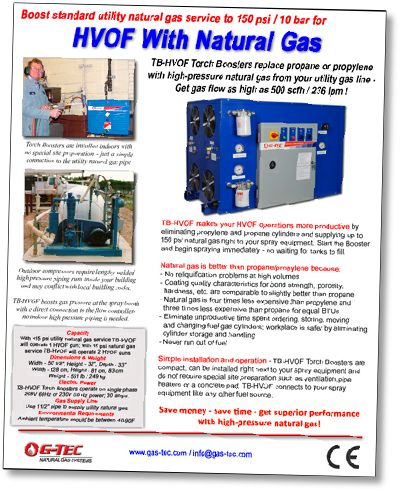 TB-HVOF Torch Booster supplies 150 psi natural gas at a flow rate up to 500 scfh (500,000 BTU) from a ¼ psi / .017 bar utility natural gas supply. With 15 psi / 1 bar gas supply TB-HVOF will run 2 HVOF systems simultaneously. TB-HVOF is easy to use...just turn it on and it is ready for immediate service - there are no storage tanks to fill. The only controls are ON and OFF because the Booster automatically adjusts to the gas flow used by your spray gun. When you are not spraying the Torch Booster automatically goes into recirculation mode. It is designed to be left running for short periods when the spray gun is not being used such as during breaks, lunch or while setting up the next spray job. It does not require operator attention as the spray gun is turned on and off. TB-HVOF cabinet measures 50 1/2” W x 33” D x 32” T / 128 cm W x 84 cm D x 81 cm D and weighs 550 lb. In North America electrical requirements are 208V, 60Hz, 30 amp service; Worldwide 230V, 50Hz, 30 amp service. Gas supply should be between ¼ to 5 psi / .017 to.33 bar and delivered in a 1 1/2” pipe which connects directly to the Torch Booster. TB-HVOF Torch Booster connects to the building utility natural gas pipe with a 1 1/2” diameter pipe that reduces to 3/4” diameter at the Booster. 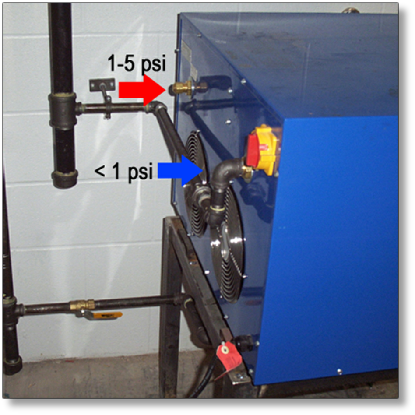 One inlet is for gas supply under 1 psi and a second for gas supply between 1-5 psi. 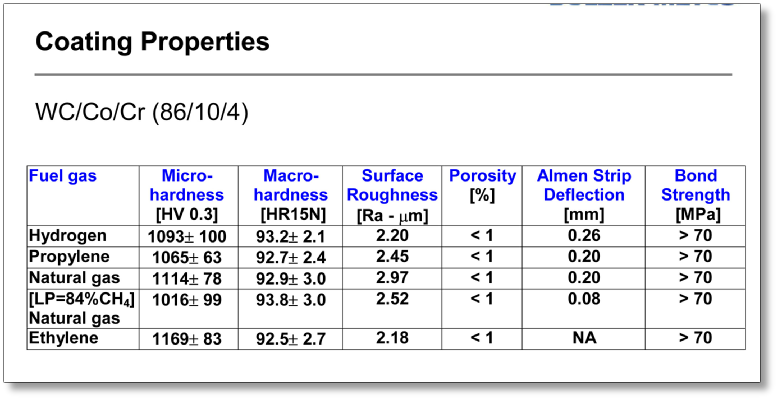 to find out more about the benefits of high-pressure natural gas for thermal spray applications including HVOF, flame spray and metallizing! Announcing Fourth Generation TB-HVOF Torch Booster! 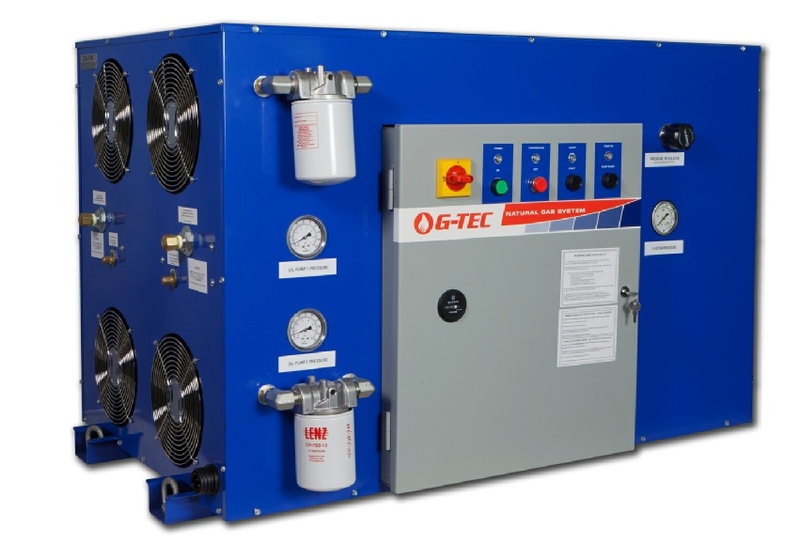 G-TEC Natural Gas Systems announces the Fourth Generation HVOF Torch Booster that boosts standard ¼ psi /.017 bar utility natural gas service to 150 psi/10 bar for High Velocity Oxy Fuel Thermal Spray. Annual maintenance is simplified, reducing cost from $ 1,000 to less than $ 200 per year. Scheduled maintenance is simply changing one filter and a check valve every 2,000 hours; oil change at 6,000 hours.